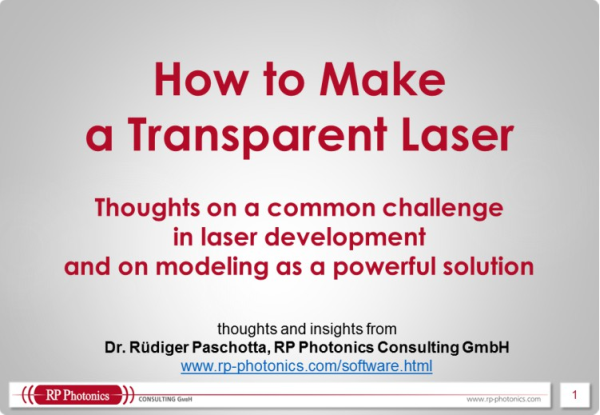 Abstract: This article points out that the term gain bandwidth in the context of laser gain media is by far more difficult that it seems at a first glance. There are different definitions, and specifications according to such definitions cannot easily be converted into each other. It requires a decent understanding to deal with that term. At a first glance, one might really not expect any difficulties with the term gain bandwidth: isn't it simply the width of the frequency or wavelength region where some laser medium provides gain? Well, basically it is, only I suggest to drop the word “simply”. A key question is whether the gain bandwidth should depend on the magnitude of the peak gain. It shouldn't, of course, if we want to specify a certain gain bandwidth for a certain crystal or glass material. On the other hand, what is of interest is often the amount of gain narrowing, e.g. in a high-gain amplifier or in a mode-locked laser, and this does depend on the peak gain. If you use the −3 dB criterion as above, this will of course be of the latter kind: the higher the peak gain, the narrower the −3 dB bandwidth. In many cases, what is of interest is not really the width of the frequency range with gain, but rather the “curvature” of the gain spectrum near its peak. This is what determines e.g. gain narrowing in a mode-locked laser. Obviously, the relation between such a figure and some conventional bandwidth specification depends on the shape of the gain spectrum, and the peak gain matters as well: for a given crystal material, little gain does little gain narrowing. a deep understanding of how a limited gain bandwidth influences the performance of a device. Don't forget the latter – in the end, we should be able to apply that knowledge in practice. As an example, it is a both nontrivial and very important question whether the pulse duration achieved with a particular mode-locked laser is limited by the gain bandwidth or by something else, such as optical nonlinearities. In the latter case, it can be a great waste of time to experiment with more broadband gain media in an attempt to get shorter pulses.